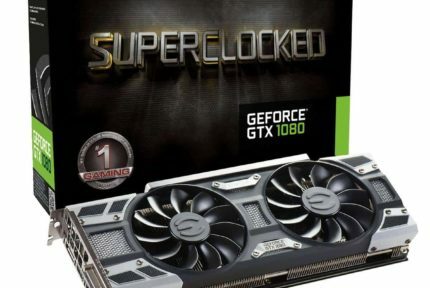 The Nvidia GeForce GTX 1080 Ti is currently the most powerful consumer graphics card on the market, right after some of the new RTX GPU’s from NVIDIA. If you have set your sights on one of these monsters either to tackle triple-digit framerates or to get into 4K gaming, you will need to pick the right model. Indeed, there are a number of manufacturers, each with several versions of this cutting-edge graphics card, but which one is the best? That is precisely what we aim to answer here! So without any further ado, you will now find the list of the best GTX 1080 Ti models, each with its own set of pros and cons that will all be discussed in order to help you make a better-informed choice. 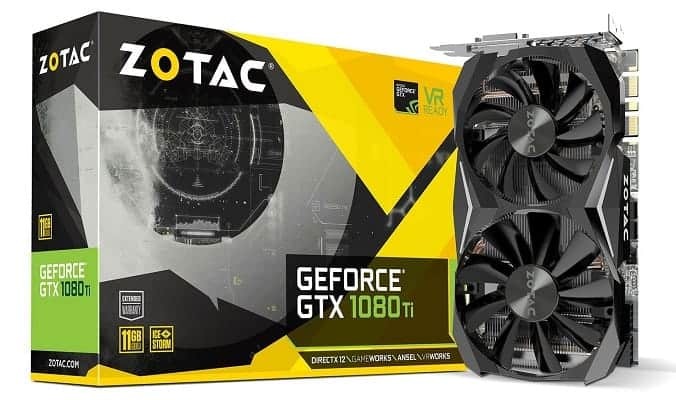 We are kicking off this list with a graphics card made by Zotac. This Hong Kong-based company is relatively young compared to some other big names, having been founded in 2006. Today, they are a trusted manufacturer of Nvidia graphics cards, as well as their own mini PCs and related accessories. The GTX 1080 Ti Mini is just what it sounds like: a highly compact variant of this powerful GPU. As a matter of fact, this is as small as GTX 1080 Ti gets. 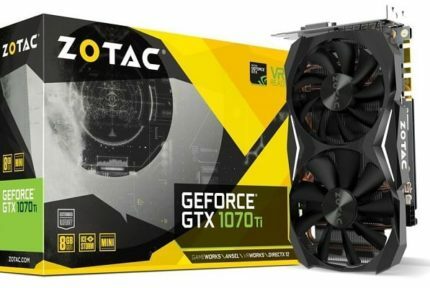 According to Zotac, it can fit in 99% of computer cases, but it does not make big sacrifices in terms of cooling as the dual fans (90mm + 100mm) can keep the temperature well within acceptable levels in most situations. As previously stated and as obviously suggested by the name, the card is quite compact. It boasts a fairly minimal exterior so as to enable better airflow. It is mostly dark grey, with the exception of two stripes on either side which sport white LED lighting, as well as the Zotac logo. Furthermore, it has a sleek metal backplate which is designed not only to help with the cooling but also protect the card from physical damage. Next up, we have another card by Zotac, albeit a more high-profile one. Unlike the previous GTX 1080 Ti Mini, the GTX 1080 Ti AMP Edition is a full-sized card ready for serious performance. It employs a similar cooling solution in the form of dual Icestorm fans which utilize “brute force” to keep the card cool. Visually, the AMP Edition doesn’t look much different from the Mini version. It has the same dark grey exterior and an almost identical backplate, with the size itself being the most significant difference. However, it does lack the white LED lighting that is present in the Mini. 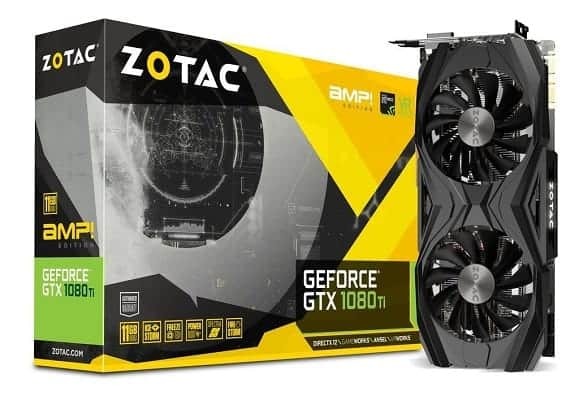 Like Zotac, EVGA is another trusted and renowned Nvidia partner, albeit one that has been around for quite a bit longer. 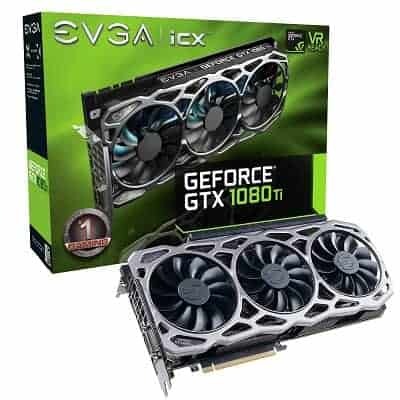 They offer over a dozen variants of the GTX 1080 Ti, but the one we will be looking at today is the EVGA GeForce GTX 1080 Ti FTW3 GAMING. FTW series EVGA graphics cards are distinctive in that they boast higher out-of-the-box clock speeds than their regular counterparts. Usually, external design is more focused on function over form, the function being providing the best possible airflow in order to make the aforementioned higher clock speeds possible, as well as increase the card’s overall overclocking potential. As you can see, the exterior design is a bit different from what you usually see with high-end graphics cards. It boasts a web-like pattern whose purpose is just what we said above – enabling better airflow. It accomplishes that goal admirably, although it is highly subjective whether the conspicuous metallic appearance will sit well with a user. Gigabyte is yet another name that many should already be familiar with. And while their Aorus series of gaming products are not as popular as, for example, Asus’ RoG, they are well on their way there. 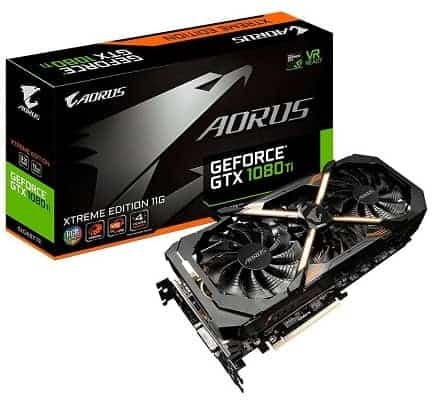 The Gigabyte Aorus GTX 1080 Ti Xtreme Edition is a serious graphics card that will leave any enthusiast satisfied. While it may look like a dual-fan card at first glance, it actually has three fans, with the first and third fans being “stacked” on top of the middle one. This allows the card to utilize three 100mm fans while being slightly shorter and wider than other cards. Something that also sets this graphics card apart from the competition is its VR Link. Namely, it has an extra front-facing HDMI port which makes it easy to connect a VR headset directly to the card. Unlike the first two Zotac models, the Aorus GTX 1080 Ti is far from neutral and inconspicuous. It has a massive profile with signature industrial orange strips seen on almost every Gigabyte graphics card and is equipped with extensive RGB Fusion lighting. It has four strips on the front of the card that form an X pattern with the center logo, a backlit logo and fan stop signal on the top, and a third backlit logo on the backplate. The Aorus RGB Fusion is not quite as versatile as Asus’ AuraSync, but it can still display the full color spectrum and comes with 5 different effects. 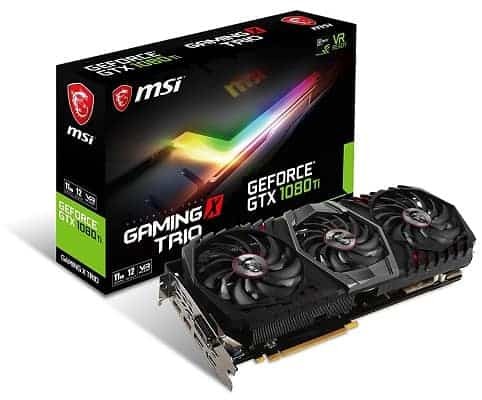 Up next, we have GTX 1080 Ti Gaming X Trio which is made by MSI, another seasoned and highly renowned hardware manufacturer. As the name implies, it comes with a triple-fan cooling solution. These aren’t just any fans either, but top-quality Torx 2.0 fans with double ball-bearings that can provide optimal airflow and function quietly even after years of heavy use. The Gaming X Trio deviates somewhat from MSI’s usual graphics card design. It trades the aggressive red for a more neutral black and dark grey exterior with only minor red highlights, a design which is bound to blend in better with a variety of configurations. Furthermore, the backplate also comes with an RGB strip and a backlit MSI logo. If any company doesn’t need an introduction, it is definitely Asus. This veteran Taiwanese hardware manufacturer is among the most versatile ones out there, making components, peripherals, smartphones, and more. The card we will be looking at here belongs to their Republic of Gamers brand, the Asus RoG Strix GTX 1080 Ti. It follows a similar design philosophy as the rest of the RoG-branded graphics cards and comes with three high-quality dust-resistant fans that, combined with the large heatsink and its efficient heat dissipation, makes this one of the best air-cooled variants out there. The card adheres to a design similar to that of other RoG graphics cards, as mentioned above. That said, it boasts a highly-detailed black exterior, a metal backplate, and extensive RGB lighting. It may not be the most minimal design, but it is bound to fit in well with most configurations and give it some of that RoG style while doing so. The lighting itself is Asus’ own AuraSync technology which is the most versatile type of graphics card RGB lighting out there at the moment. It can display the full color spectrum and comes with 6 different effects. As you can see, there are quite a number of options available if you have decided on getting a GTX 1080 Ti. So, what do you need to look out for in order to make sure that you pick the ideal one? They offer the overall best cooling. 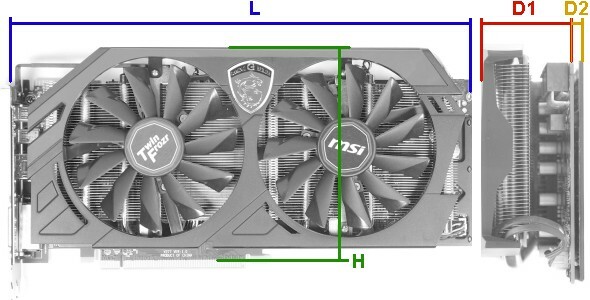 Blower fans are good for the more cramped computer cases, but given the immense size of even the smallest GTX 1080 Ti cards, a blower fan’s disadvantages (higher average temperature, noise) greatly outweigh that advantage. 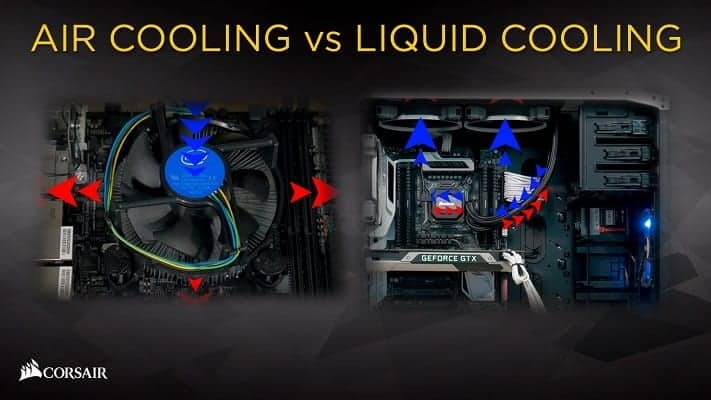 Liquid-cooled cards are not widely available. While they may offer superior cooling ideal for avid overclockers, we have opted to not include any of such cards both because of their limited availability, as well as the dubious value that comes with their higher price tags. The question remains: do you go with a dual-fan or triple-fan card? Noise – Triple-fan cards are actually quieter for the most part. Since the card has three fans, they will be running more slowly and thus more quietly. They are only louder when the card is pushed to its limits. Overclocking – Obviously, three fans will have more air coursing through the heatsink, leading to better heat dissipation. This obviously leads to better cooling, and as such, a triple-fan cooling solution is ideal if you plan on going past the factory OC values. When talking about the size, you should consider both the cards length and width. The length is important for when it comes to fitting the card inside the computer case. Usually, a GTX 1080 Ti will be a tight fit for a Midi Tower case, with the exception of those that make extra space by reducing the size of the HDD rack. The width is more about how the card will fit on the motherboard. Namely, due to their massive heatsinks, these graphics cards can take up two or even three slots. This is especially important to keep in mind if you have other PCIe extension cards installed or if you’re planning on a multi-GPU setup. Next up is the usual question of hardware compatibility. There are three components that you need to ensure the graphics card will work with: the motherboard, the CPU, and the power supply. Motherboard compatibility is a really simple matter. All that you need to do is ensure that it has the required PCI 3.0 slot to interface with the card, and seeing as it is the standard today, every motherboard has at least one. As for the CPU, what you need to pay attention to is make sure that it is powerful enough i.e. that it will not bottleneck the card. And what is bottlenecking? Essentially, it signifies that a weaker processor will not be able to push a GPU to its maximum capacity. For the GTX 1080 Ti, the latest Intel Core i5 processors will suffice, while the Ryzen 5 and older generation i5 CPUs will lead to slight bottlenecking. Unless you’re planning on a multi-GPU setup or getting the absolute 100% out of the card, then i7, Ryzen 7, and the more powerful processors are unnecessary. Finally, there is the power supply. As you can see from the article the recommended PSU power for a GTX 1080 Ti is 600W, and most of them have their power consumption rated at around 250W. Keep in mind that the power draw will increase with overclocking, sometimes quite significantly. However, unless you have other demanding components, a 600W power supply will be more than enough. It is important to keep in mind that every GTX 1080 Ti is essentially the same. Every version comes with the identical Nvidia GPU, and the only things differing from manufacturer to manufacturer are the quality of the cooling, the factory clock rates, and the visual appearance. It is entirely up to you to decide which fits your needs best in terms of aesthetics and overclocking ambitions, but in-game performance will be mostly the same. As you can see, each GTX 1080 Ti variant comes with at least one DisplayPort, HDMI port, and Dual-Link DVI-D port. So, which should be your connection of choice? DVI is an almost outdated technology. It doesn’t support 4K/UHD resolutions and can only reach triple-digit refresh rates in 1080p. On top of that, unlike the other two connectors, it cannot transfer sound. DisplayPort and HDMI are by far the most popular, the former being preferred for monitors and the latter for TVs. 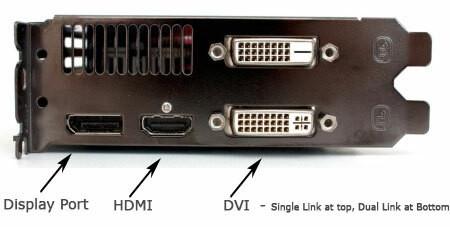 Still, almost every monitor will have both a DisplayPort and an HDMI port. DisplayPort does support higher refresh rates at higher resolutions, but that is hardly relevant given the current technological limitations. When it comes to making a choice between the 3x DP/1x HDMI and a 2x DP/2x HDMI GTX 1080 Ti, it’s all about your desired configuration. If you’re planning on a triple-monitor setup, then three DisplayPorts are an obviously better choice. On the other hand, if you intend on connecting a monitor via HDMI and have a VR headset connected at the same time, two HDMI ports would be ideal. 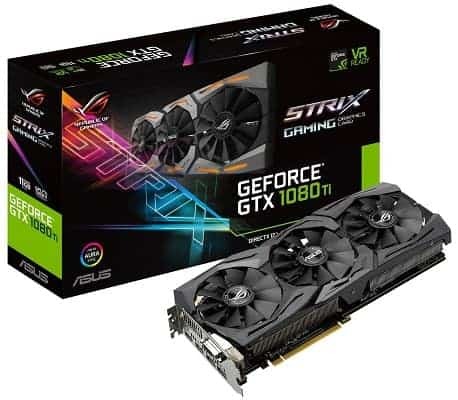 There is no way to pinpoint a single GTX 1080 Ti graphics card that would be optimal for every user out there, but if we had to pick, we would have to go with the Asus RoG Strix variant. This is not the first time we have given the first prize to a ROG graphics card, but it is a wholly justified decision. The card simply has some of the best open-air cooling, the best RGB lighting, and it will fit in with pretty much any configuration. That, of course, is just our pick. 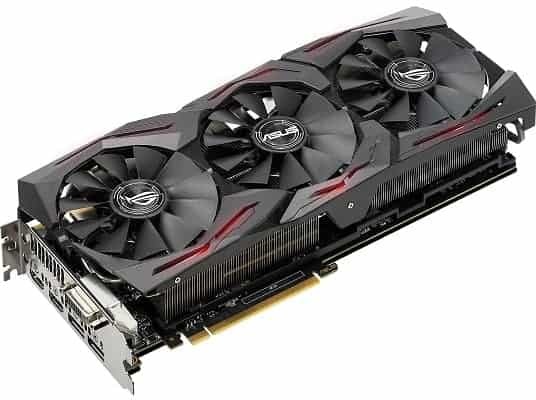 Every graphics card listed here is a top-quality solution that will not leave you wanting, as long as you keep your own requirements and preferences in mind when deciding on which model to get.